Home » How to change iPhone contacts sort and display order? This quick guide shows how to change the sort and display order of your iPhone contacts within CopyTrans Contacts. 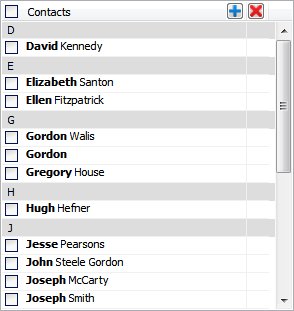 The tutorial also demonstrates how to sort contacts by source (i.e. local contacts, iCloud contacts, Gmail contacts, etc). In the main program window, find the Funnel button and click on it. You can now change the “sort” and “display” order of the iPhone address book as shown in the main program window. NOTE: By default, your iPhone contacts will be displayed with the first name appearing preceding the last name, for example “David Kennedy”. Also by default, your iPhone contacts will be sorted by the first letter of the first name, for example “D” for “David”. 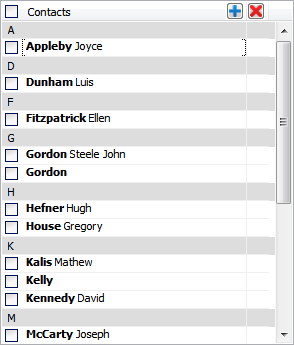 In this example, I set the display order to “Last name, first name”, i.e. : “Kennedy David”. I also set the sort order to “Last name, first name” so “Kennedy David” is now listed under “K”. The sort and display order settings are only valid for how your iPhone contacts appear within CopyTrans Contacts. The way your iPhone contacts are sorted or displayed on your iPhone is not changed. To change the sort and display order on your iPhone, go to your device, tap “Settings > Mail, Contacts, Calendars” and under “Contacts” change the “Sort Order” and “Display Order” accordingly. 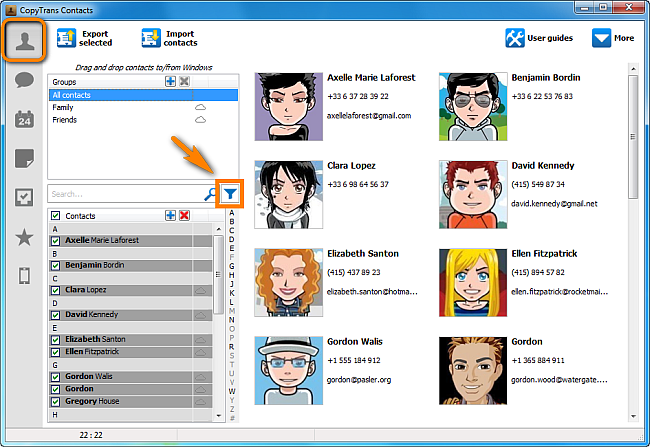 CopyTrans Contacts also allows you to filter and sort contacts by source. This is useful if you have many contacts on your iPhone synced from multiple accounts such as iCloud, Gmail or Yahoo. To display contacts only from a certain source (i.e. iCloud), click on the Funnel button then click Filter and select the account from the list. 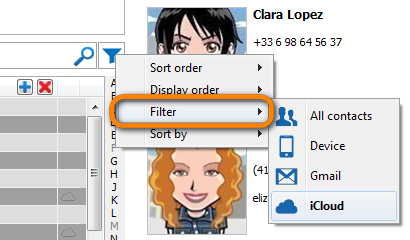 To sort the contacts by their source, click on the Funnel button, then click Sort > Source, Contact name. If you have any questions left, don’t hesitate to contact our support team.